You are absolutely right: It has been far too long since we’ve written to each other. Thanks for the update on your life in this final year of seminary. It does sound really stressful. 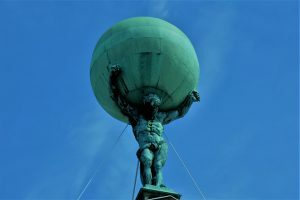 You probably feel like the weight of the whole world is on your shoulders — like poor old Atlas. I could act like a cynic and say that the stress of seminary is intended as a beneficial part of your theological education. After all, being a pastor is often stressful, so now is a good time to get used to it. I won’t say that. But stress is always there to be found, and now is always the best time to find helpful ways to deal with it. It sounds like you are dealing with stress that is coming at you from several angles at once. You are still dealing with the grief over your mother’s death. Your whole campus knows your mom died, so you have to dodge all their well-intentioned attempts to practice their skills at pastoral care. Your field education post is demanding. Your ordination process for your denomination is demanding. Your efforts to learn about the available positions to apply for once you graduate are demanding. He tried in good faith for the two weeks we studied the practice, but he just didn’t get it. Rote repetition wasn’t his thing. Then we got to the end of the year and my assignment was for the students to pray in whatever way they wanted, so long as they used one of the classic practices we’d studied together. I hadn’t taught the Jesus Prayer primarily as a way of coping with stress, but for that student it proved useful in exactly that way. It recently worked that way for me too. I had two hospital stays in two weeks, one for surgery and one for subsequent infection. Sometimes I was in pain, and sometimes I was just enduring the long slog away from the fear of death. The TV did nothing for me. I was rarely able to focus on a book. Some can’t abide repetition in prayer, but this prayer is worth repeating. It is all good prayer distilled to its powerful essence. No matter what our situation, what we really need from God is mercy — we’ve earned nothing, but we need so much from God’s generous grace. We see that generous grace in the face of Jesus, God’s Son, the Second Person of the Trinity incarnate. As I prayed the Jesus Prayer over and over from my hospital bed, it calmed me. I said it along with my breath. It focused my mind on what is most important: the holy healing presence and mercy of God. This has two great benefits. First, it focuses your heart and mind, leading to increased calm. Second, and far more important, God hears you and provides the mercy you need. Go for it. Jesus is waiting to hear from you, and he’s full of mercy. My annual lenten prayer class is coming soon! We’ll work on the Jesus Prayer and other classic approaches to prayer that help re-ground us in Christ and bring focus to our prayer lives. Click the button and get on the waiting list if you want to be notified when it is open for registration.